Francesco devised this salad – One of the most popular salads we serve at Remi – as a medley of flavors. 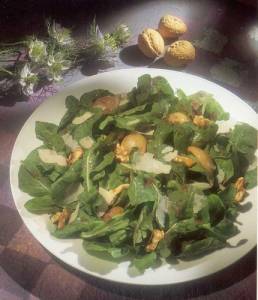 The bitterness of the arugula is contrasted by the slightly salty dressing and the nutty cheese. The shallots, if they are added, provide a classically Venetian balance of sweetness. The result is a dish of unusual character, having all four main flavor groups – sweet, sour, salty, and bitter. That might account for the salad’s uncommon appeal. It is important to rinse and dry arugula very thoroughly. Removing the heavy stems makes it more attractive to serve. Toast the walnuts in a toaster oven or by tossing them in a dry skillet over medium heat. 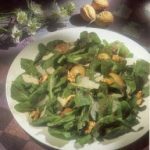 Place the arugula in a large bowl and toss with the vinaigrette dressing. Divide the arugula among 4 plates. Top each portion with some shaved Parmesan and a scattering of walnuts. Garnish each plate, if desired, with 3 to 4 sweet and sour shallots.